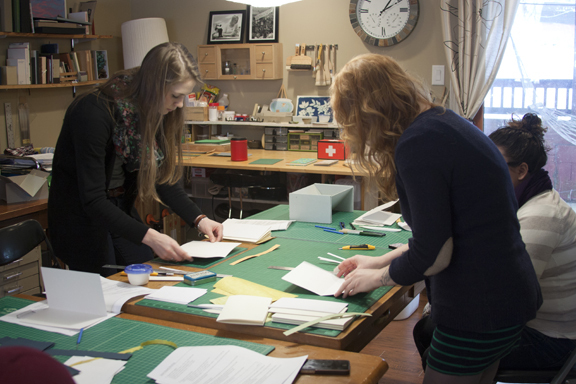 On January 19th, I hosted six students for the Sewn Board Binding Workshop. We had a really fantastic time due to everyone’s enthusiasm! 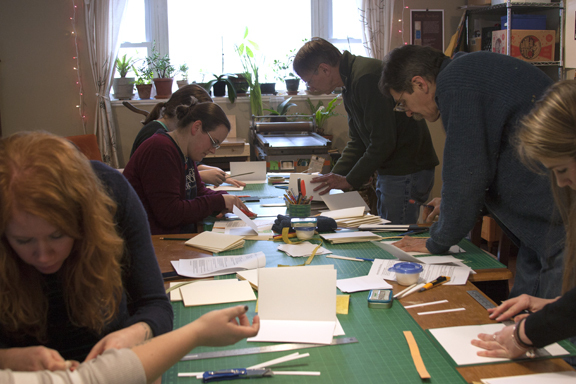 We began the afternoon with a demonstration on cutting several sheets of paper to uniform size and prepared the materials for sewing. 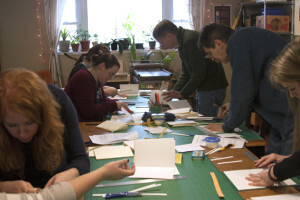 Once we had all cut our sections, they were folded and the cover boards prepared. We carefully stabbed holes for sewing into each section and the cover boards and threaded our needles. We took a brief break together and enjoyed tea, coffee and cookies while we all had a chance to get to know one another. 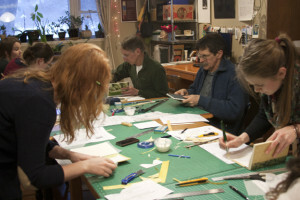 In addition to providing a little mental break, this is one of the best parts of a workshop as everyone can really start to get to know one another. Recharged, we went through the process of sewing our books and were well on our way to having the finished project! 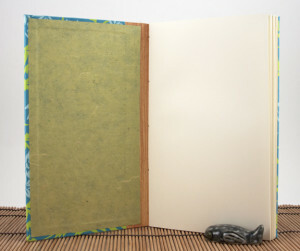 The cover stiffener was put in place and the decorative paper was wrapped on the boards. 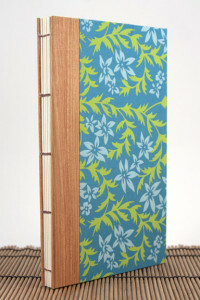 Finally, the style of end paper attachment was chosen and glued down on the inside of the covers. Everyone ended up with wonderful books that will hopefully inspire new endeavors! A big thank you to everyone who came and made the workshop a success!